Cabinets will play a major role in your kitchen remodeling costs. Kitchen renovations can be invasive and expensive, but they can also be done for less than many other projects. Materials, procedures and installations can all vary tremendously based upon the work being done, the desired finished look and the materials selected. To make sure your kitchen remodeling costs are in line with what they should be, some comparison shopping may be in order. One of the reasons why kitchens can be notoriously difficult to price out is due to the many variable components. Cabinets can be replaced, refaced or painted. Countertops can be made of several different materials, each one with a cost range of its own. Flooring can be left as is or replaced as well, so the costs of each kitchen can range dramatically. When initially pricing out a kitchen renovation, consider each of the areas being rehabbed and determine the level of renovation you wish to do to each. If your kitchen cabinets are in good shape and in a good position, they can be painted for as low as $50 or refaced for a few thousand. However, if the cabinet boxes are in poor shape or the kitchen is laid out poorly, you may need to remove the cabinets and install new ones, which can cost anywhere from $6,000 to $20,000 for the cabinets alone depending on material, finish, number of cabinets and number of extras, such as tall cabinets or corner cabinets. Kitchen countertops are another example of an extreme range in kitchen costs. Existing counters in good shape can be painted to resemble granite or concrete for as low as $25. Removal and replacement of a countertop starts around $20 a foot for less expensive materials and can go as high as $400 a foot for some of the more exotic granites. For more solid, slab countertops, however, you can expect to pay approximately $100 a foot for the material installed. This does not include special stove top cutouts, edge details or special installation such as overhangs, all of which can cost extra. If you are replacing your kitchen flooring, expect to find porcelain tiles starting around one dollar a square foot and ungauged slate tiles starting around one and a half dollars a foot. All other materials go up from there and it is not uncommon to find stone, porcelain and wood flooring going for around $20 a foot. Keep in mind that when purchasing less expensive materials like ungauged slate that your installation costs will double. The same goes for installing a tile or wood pattern or inlaying two materials. The kitchen backsplash is the final component in any kitchen design. While it is used to help protect the wall behind your sink and stove, its true purpose is actually decorative. Any material can be installed on a backsplash, which means that you can have an inexpensive splash for one hundred dollars, or an over-the-top splash that costs ten thousand, which consists of a handpainted mural and decorative tiles. 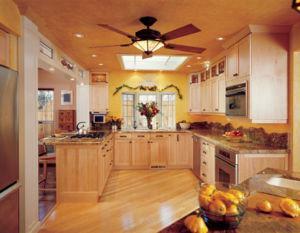 Lighting is crucial to the kitchen design, and a renovation is the perfect time to upgrade any lighting in the space. While lighting in itself is not overly expensive, it's the amount of lighting that begins to add up. Under the counter lights, recessed lights, soffit lights and decorative pendants are all components of most new kitchen designs. While they greatly enhance the usability of the work space, they also add tremendously to the price. While it is certainly possible to go all out during a kitchen renovation, purchasing the best of everything at any price, it also isn't necessary. Some kitchens that have sound flooring, cabinets or lighting do not need a total rehab. Others will need a total rehab, but time and money can be put into those areas that get the most use, such as a good quality sink and faucet, while things like the cabinet knobs can be overlooked slightly. Keep in mind that some parts of a kitchen renovation, such as the backsplash, do not need to be installed at the same time as everything else. Spreading out the renovation slightly can also help to keep costs down. As you plan your kitchen renovation, consider purchasing one component of the best quality you can afford and allow the other components to downgrade slightly. This may mean refacing existing cabinets, while investing in a granite counter, or it may mean making do with a less expensive floor tile because the backsplash is so dramatic. No matter what your particular kitchen ends up costing, be sure to shop around and make sure that each piece you purchase is exactly what you want for exactly the right price.